Home Expert Advice Skincare Advice Acne & Breakouts Can You Really Detox Skin? 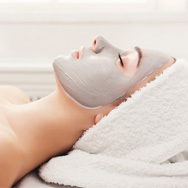 Detoxifying facial masks and other treatments that promise to purge skin of toxins may sound impressive, but the reality is far from it. Products labeled with claims such as “detox for acne” are even more infuriating and misleading because they often leave breakout-prone skin in worse shape. Let’s set the record straight on skin detoxes once and for all. Toxins are produced by just about everything: plants, animals, insects, industrial waste, people, smoking, garbage, heavy metals, cars, and on and on and on. Despite what you may have heard, toxins cannot leave your body through your skin or pores—it’s physiologically impossible. Instead, this job falls primarily to your kidneys and liver, the body’s detoxifying organs, which do a pretty good job on their own, as long as you’re healthy. There are a handful of studies indicating that sweat (not skin or pores) can act as a carrier in “detoxifying” by removing trace heavy metals from the body. However, before you jump into the sauna, take into account that the methodology of those studies is considered questionable at best when reviewed by third-party experts. Even if it were possible to eliminate traces of toxins through sweat, “trace” means just that … negligible and pretty much meaningless for the health of your body. We’ve already established that toxins cannot be purged via your pores, but what makes the case against “detox skin care” even stronger is that the products that claim to eliminate toxins from your skin never truly specify exactly what types of toxins they eliminate. The companies behind these detox products expect you to just trust them, but we’re not so keen on blind faith. As we always say: Stick to what the research says really works and ignore the fantasy claims because they aren’t going to help your skin or your wallet. There is a difference between products claiming to purge skin of toxins in the body, versus products that can help defend skin from toxins in the environment. Antioxidants really can help thwart the negative effects of environmental toxins by interrupting the free radical damage they cause when used as a part of your daily routine. A simple solution: Use a sunscreen enriched with antioxidants, so you’re getting double the benefit (sun protection and environmental protection) by only using one product! BUT despite claims to the contrary, the truth in beauty is there is no way to purge toxins out of skin. It isn’t physiologically possible. By now, you know the answer, but we’ll drive the point home: You cannot detox to clear acne breakouts in any way, shape, or form. Not through facial detox for acne, not through detox masks for acne or any other acne treatments making detox claims. In fact, these products often contain drying and irritating ingredients like witch hazel, menthol, alcohol, or abrasive scrub agents, which only make acne worse. Why can’t detox for acne work? Because acne isn’t caused by toxins. The underlying factors that lead to acne are as far removed from true toxins as fire is from water. Instead, look for proven solutions for acne, including the well-researched anti-acne heroes, salicylic acid and benzoyl peroxide.